Home / FAQs / What do naturopathic doctors mean by treat the whole person? Multiple factors contribute to your health, including diet, lifestyle, genetics, psycho-emotional makeup, spirituality, socioeconomic position, environmental issues, and more. Naturopathic doctors (NDs) follow six guiding principles that serve as a philosophical platform for all of naturopathic medicine. The principles influence how NDs think about medicine, make clinical decisions, and most importantly, how you are treated as a patient. Treat the whole person is one of these six core principles. Multiple factors contribute to your health, including: diet, lifestyle, genetics, psycho-emotional make up, spirituality, socioeconomic position, environmental issues, and more. Licensed naturopathic doctors are trained to uncover, evaluate, and address relevant obstacles to healing. They take extra time with patients and provide highly individualized care. 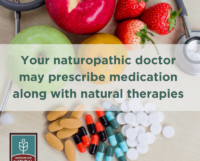 Guided by the Therapeutic Order, naturopathic doctors focus on identifying the underlying cause(s) of your health concerns and empowering you to engage actively in restoring and managing your own health. Research shows that whole-person care often leads to higher patient satisfaction and improved outcomes. Sometimes aches and pains, stomach discomfort, trouble sleeping, and numerous other symptoms are indicators of underlying illness. 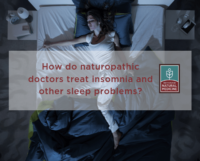 While these symptoms can be reduced or managed, it is more important to understand and treat the root cause, which is the focus of naturopathic medicine. This takes time and comprehensive evaluation encompassing physical, behavioral, emotional, and other key components of your health. Treating the whole person involves giving each person tailored and personalized therapies specific to their genetics, nutrition status, lifestyle, and capacity for implementing suggestions, not just a set of instructions to follow. In order to assess, educate, and inform patients adequately, NDs often spend one hour or more with patients in an initial appointment, and 30+ minutes in subsequent appointments, compared to an average 20 minute appointment with a conventionally trained physician. NDs recognize that both psycho-social factors and lifestyle choices are central contributors to illness and chronic disease. Among U.S. adults, 90 percent of Type 2 diabetes, 80 percent of cardiovascular disease, 70 percent of stroke, and 70 percent of colon cancer are potentially preventable by modifiable lifestyle changes. NDs’ rigorous training in areas such as clinical nutrition, behavioral medicine, botanical medicine, and others makes them expert at prescribing and supporting essential, effective, and enduring behavior and lifestyle modifications which impact health outcomes. 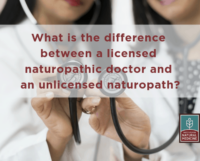 Because of their focus in these areas and others, naturopathic doctors may be a good fit for people looking for a more comprehensive perspective on health concerns, or for a whole-person approach to health care. A service for consumers from the American Association of Naturopathic Physicians (AANP) and the Institute for Natural Medicine (INM). The AANP and the INM would like to acknowledge Amy Rothenberg, ND, for his contributions to the content of this FAQ.